I have a question about my sidebar. Av8rmike, I'd love it if you'd help me since you have the set up on your journal that I'm looking for and you were most helpful with my last question. I want to customize my sidebar myself and not use the little box for html that's already offered there. On my old layout I had my sidebar completely writen out. I would like to do that again and have the little dividers that are there for topics like "watching", "Reading", "Gaming" etc. all within the little purple dividers. I'm guessing these are images stored by LJ somewhere on the server. Here's is a Pic where I circled what I mean. On your journal you have these divisions such as, "support links" "weather" and such. This is what I would like to do with my sidebar. Oh and I'm using the Miami layout. Well, you're talking about a few different things at the same time. If what you want to do is give different headings to the Links List, you can do that here (instructions are on the right). However, the Links List only works with text links; you can't insert images there. If you want to do something like multiple custom text boxes, you have to do it through a custom theme layer. I have some example code for making multiple boxes here. Is this anything like what you wanted? 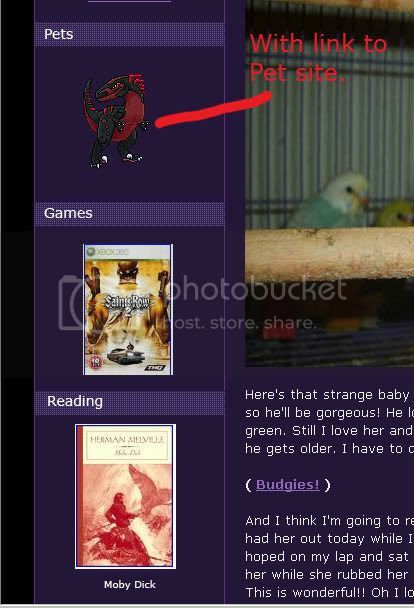 No, I said I wanted my sidebar to look like yours with different topics listed in the little purple bar I circled as an example to show what I meant. I didn't mean the links. I tried the second link you gave me and it is not working. I wish it would keep the code with the errors in it so you could view it. I posted the link to that in my first help request if you want to look at it. I'm getting this error. I want several custom boxes like the ones already there. Like yours that says the weather and has little images and links. EDIT: I made a picture perhaps this will be a better example of what I want. OK, I get it. There must be something wrong with the syntax of the code you're trying to use, which is what the compiler error means (it's expecting a ";" but is getting the word "Stuff"). Can you copy & paste the code you're trying to use in a comment? You'll need to "escape" the HTML elements before you submit, or if you don't know how to do that, just change any <> angle brackets to  to keep the HTML from being formatted. Oh I'm sorry. I must have copied the old error and changed the code and still got an error. I tried putting it in without changing anything you had said. I think I wrote "Stuff" where you had the red text to see if it would come up. Also I already have a bunch of custom code in there. Does this need to go outside of that. Outside of the three quotes? """; Of my first custom code that is. OK I just tried placing it outside. No errors but nothing shows up as well. I wrote "Stuff" and "Test" where you had the red text. No html because I didn't want to mess with that yet. So far nothing's shown up. But now I think we're getting somewhere. You should be able to see it now. It's at the bottom of my code. to say "customtext" instead of "none". That did it. Thank you very much! My journal almost feels like home. One last question. In the links section the links have spaces between them making them longer than necessary. Is there a way that I can have them single spaced? I put them in the easy way or is this something I just need to delete and make a new custom text box for? I'm going to do more tweaking, but it's almost done. If I get stuck I'll definitely ask again. You've been very helpful.